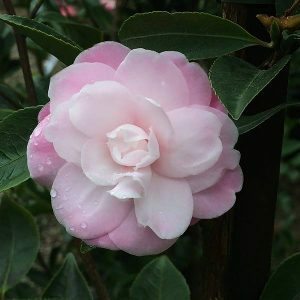 This is a Sasanqua type, and Camellia ‘Sweet Jane’ is not only bred in Australia, it is also said to be the longest flowering of all of the camellias. Flowers buds are soft pink, semi double and open to pale pink ageing to almost white. It grows well in full sun, and once established is remarkably hardy. The flowers may not be a large as some, however they do appear in profusion for 5 – 6 months. The flowers sit against a deep green foliage. With a good upright habit Camellia ‘Sweet Jane’ can reach around 2 to 3 metres in height over time. It will spread to around 1.5 metres, however is easily pruned to shape and size. With its naturally dense foliage Camellia ‘Sweet Jane’ makes an excellent screen or hedging plant. It is also suited to growing in containers, or as a feature plant in the garden. Ensure that the soil is humus rich and well drained. A slightly acidic soil is best. Water in new plants with a liquid seaweed fertiliser. Mulch to maintain a cool root run. In very hot windy positions, some protection form the afternoon sun is recommended. Annual pruning immediately after will promote stronger flower growth and maintain a tidy habit. Flowering period – Autumn through to spring. Fertiliser – Slow release, Camellia and Azalea fertiliser in spring.